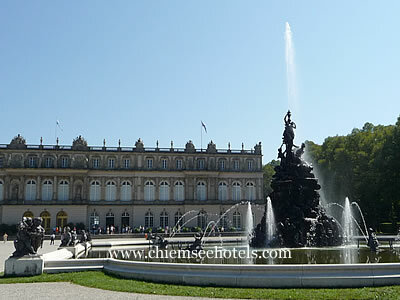 Herrenchiemsee, the castle built by Bavarian King Ludwig II as a tribute to Versailles, is one of the most popular tourist attractions on the Chiemsee. The castle is located on the largest island in the lake - the Herreninsel - and is easily reached from Prien and Gstadt (there are also ferry services from Bernau in the summer months). The ferry landing is on the northern side of the island, with views over to the nearby lakeshore and area around the village of Gstadt. There is a ticket office and information centre for the castle located immediately on exiting the landing pier. The island itself is around 2km² and there are various ways of walking to the castle (which is located nearer the southern end) as well as the occasional buggy (for hire). Those who are feeling energetic can take a 7km scenic circular walk around the island. Immediately on the right after passing the information centre the former Augustine Abbey of Herrenchiemsee can be seen. This was founded in the same era as its sister on the neighbouring Fraueninsel by Duke Tassilo III of Bavaria. It is also known as the "Old Castle" as it was used as a residence by King Ludwig II during the work on Herrenchiemsee itself (the "New Castle") and there is a museum in the building showing his private rooms. Twenty minutes' walk from the landing stage, the castle and its gardens finally come into view. 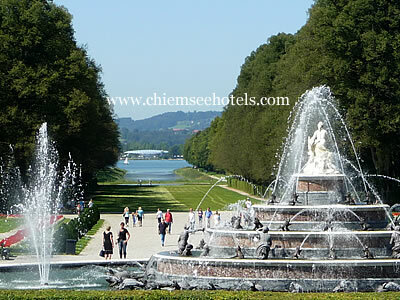 Herrenchiemsee is one of the three famous castles in southern Bavaria associated with the romantic history of Ludwig II of Bavaria - the others being Linderhof Castle near Oberammergau and Neuschwanstein Castle near Füssen. Space is too short to repeat all the tales of Ludwig's obsession with the legends of Germany's past, his escape from reality into art and architecture and his great but ruinous vision of monumental construction works which led directly to his downfall. Herrenchiemsee was designed as a symbol of the affection and respect that Ludwig felt for Louis XIV of France (otherwise known as the "Sun King"). The views through parkland to the castle, the fountains and the look of the building itself are all consciously a homage to Versailles. Ludwig acquired the Herreninsel in 1873 and work started on the castle five years later. Despite the tremendous amount of planning and money the building was never finished and, after Ludwig's mysterious death in the Starnberger See (another lake to the south of Munich), parts of the castle were demolished. Nonetheless the castle and its lovely setting attract more than 10,000 visitors a day in summer high season. The castle can only be visited as part of a guided tour - times for tours in the various languages are allocated on purchase at the ticket office near the ferry station. The tour itself takes just over 30 minutes and afterwards there is an opportunity to visit the King Ludwig Museum, which documents the life of the monarch, on the ground floor. In the summer months, the fountains in the gardens play every 30 minutes.